A while back I read in an article in The Rafu Shimpo that the cemetery at the Tule Lake Segregation Center, which at one time had 331 buried there, was desecrated after the camp closed. The article reported that the entire gravesite was plowed over, even with some remains still buried there, to be used later for a landfill. This insensitive and inhumane act is hard to believe. What human being would commit such a heinous act at a place that is sacrosanct? One answer may be that it being shortly after WWII it must have been the act of racists who felt no qualms about destroying a “Jap” cemetery. But then the question arises — who gave them the authorization to do this? The other night I attended a Tule Lake planning workshop in New York sponsored by the National Park Service. During the question-and-answer period I gave a short historical background about the cemetery desecration and questioned what, if anything, was to be done about it. The answer was they did not know the full story and that there are also no records, but research is being conducted in locating the actual site. I’m sure those who were buried there were mostly Issei who were born during the Meiji jidai, the reign of Emperor Meiji (1868-1912). They first came to this strange country with few personal belongings, not speaking the language and facing racism. But they arrived with the spirit of gambaru and above all their own set of values. Sadly, this great Issei generation is now gone. And it now becomes incumbent upon us as their descendents in kansha (gratitude) and giri sense of duty to do something of value to bring meiyo (honor) to the Issei 331. We can learn from the past. This example of kansha, giri and meiyo goes back to the 6th century B.C. as found in the legendary story of Mogallana, a devout Buddhist disciple. The story goes that he saved his deceased mother who was suffering and by following Buddha’s advice was able to free her and give enlightenment. To give thanks and in gratitude, he and his friends celebrated in a joyful dance. Now throughout Japan and in the U.S. and elsewhere, wherever there are Nikkei there is the annual Obon Odori ceremony observed. One does not have to be Buddhist to participate and there are many from different ethnic groups who join in this annual ceremony. The Obon is a religious celebration to honor and thank our ancestors of the past in gratitude for the better life we are now living. So then what is the meaningful act that must be done for the Issei 331 where their last domicile was called euphemistically a “segregation center” when in reality it was a concentration camp where they died? It is to go from what was a desecration to a divine dignity. One way to do this is to build a permanent memorial at the site where the cemetery once existed. A dark granite wall with all the names of the 331 engraved, with a short background of what happened at the site in English and in Japanese. Instead of empty ground there will be a permanent monument for the Issei 331. Then it will be there for the next of kin of those who were once buried there and the future generations to come, to see, to know, to pray and to honor them. This can and must be done. 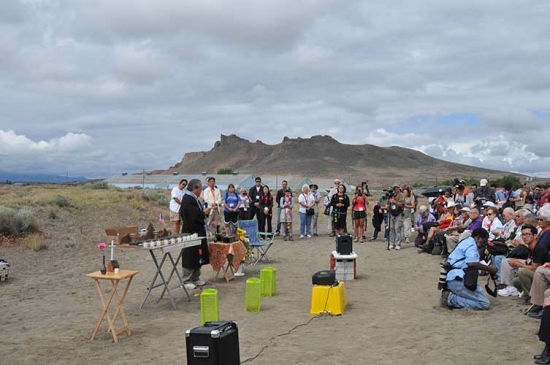 There were once 18,000 incarcerated at Tule Lake. Some of their loved ones may have been buried there at one time. The monument will become the one place symbolic for them and for all others to pay their respects. There are other symbolic artifacts to consider for rehabilitation but the monument by all means should take precedence. It is something of importance and true value that we owe to the Issei. It is about our people and the respect we owe them. And it seems at the present there are no plans for the desecrated cemetery. There are government grant programs for some organization to pursue for this purpose or to have a nationwide fundraising campaign. This is a mission for all of us, a call and a challenge. It is our giri to take this up as our sacred project. And when this memorial monument is finally completed, then indeed at last the spirits of the Issei 331 will rest in peace and in honor. Stanley Kanzaki, the author of “The Issei Prisoners of the San Pedro Internment Center,” writes from New York. Opinions expressed are not necessarily those of The Rafu Shimpo.